Short and sharp in the reviews today. Looked at 10 wines but 5 had been reviewed already this year, and one other was a Sauvignon Blanc from Marlborough that couldn’t be found in any records anywhere. On special at one of the big supermarkets – maybe that tells you something. Yep, I can taste it now. A no brainer – shiraz, and probably Barossa. OK, so this is not from Tasmania but it is cool-climate. 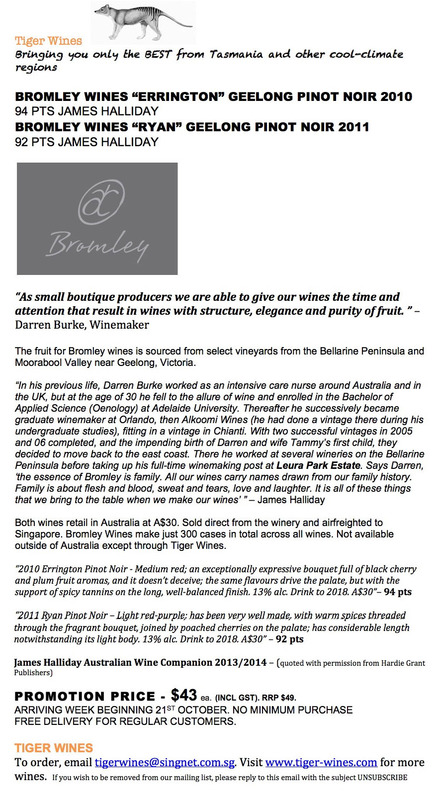 A couple of lovely wines from Darren Burke (winemaker at Leura Park) under his own family label Bromley Wines. Actually, YellowTail Reserve is pretty good & the Shiraz made the Wine Spectator Top 100, but you can’t buy it in S’pore. Hope your health continues to improve. G.